Here you are in your munificence standing up for life in the soil. Here you are in your vibrant aliveness daring to speak out against the latest insult to organics.You know in the depths of your being that an organic farm can not be a chemical factory.Your soul shudders at the prospect of fruits and veggies grown in soybean soup. Here you are protecting this American earth. May you and your family blossom in good health, prosperity and success. Still on a pistachio kick! The other day we made that delicious Pistachio Green Dream Smoothie, right? Well, I had some gorgeous pistachio pulp left over and decided to use this and create a new cracker recipe. I ended up with these fantastic crisps. 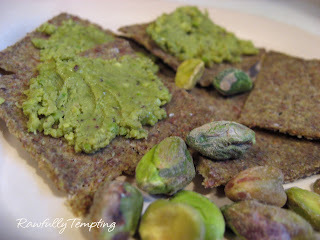 Eat as is, or smear with some luxurious Pistachio Butter. If you are missing crunchy munchies…you will love these! We make our Organic Walnut Butter by slicing raw walnuts into a luxurious spread then seasoning it with a little Royal Himalayan Pink Crystal Salt. Try this delicious Walnut Butter on apple slices or carrot sticks, with a few raisins or a little honey drizzled on top. Please note that we’ve lowered our free shipping threshold to $100 and eliminated the Medjool date bonus. At first we were using sustainably grown Hawaiian macadamia nuts. We have switched over to organic macadamia nuts. Henceforth Milk of Paradise is organic! Cashews and Hawaiian Macadamia Nuts make for a profoundly rich and creamy combination. Our Organic Macadamia Butter has a rich, milky flavor that will delight your tastebuds. For your delight we have slowly sliced organic sunflower seeds into a butter that goes well on apple slices as well as celery and carrot sticks. Try adding chopped raisins and dates too–what hor d’oevres you’ll make! Sunflowers dance in the sun; perhaps our newest creation will bring some of that gladness to your table. Sunflower seeds are rich in vitamin E, an antioxidant. They are also a wonderful source of tryptophan, an amino acid, as well as fiber and protein. Our Alive Chia Seed Oil is a bountiful source of omega-3 essential fatty acid, as well as protein and calcium. Honey and Royal Himalayan Pink Crystal Salt accentuate its flavor and preserve its freshness. Our alive coconut butter is created from alive coconut. Savor its fragrance. Ponder its texture. Golden berries, also known as Physalis peruviana, is South American fruit that’s highly concentrated with nutrients and bioactive compounds. They can be eaten fresh or dried – they have a delicious “sweet and sour” taste that both adults and kids enjoy. They can be added to any recipe that calls for fruit (fresh or dried), including salads, as a jam, on top of granola or yogurt. Our alive cacao butter is of outstanding quality, It comes from the island of Bali. Cacao Butter is a key ingredient in making fine chocolate and confections of all sorts. Grate and add to melted cacao paste along with a sweetener such as honey, agave or palm nectar crystals to make a delightful chocolate. Macadamia nuts contain a significant level of protein, comprising essential and non-essential amino acids. Our macadamias are crisp, fresh and alive! Beginning with turmeric, we have added raisins, honey, sesame and spices to bring you a delightful spreadable. We urge you to research what people are saying about the qualities of turmeric. Olive oil aficionados! This is the moment you’ve been waiting for all year! Olio nuovo is here! The first expression of the olive harvest!The first pressing! The ultra-green first bottling of the new crop! Skimmed from the vat before the sediment has settled, olio nuovo has a creamy texture and heightened notes of fruit, grass and pepper. This delightful and fresh nut will nourish your body and your taste buds! Our pistachio butter is made from pistachios grown by California family farmers in the rich, alluvial soil of the wondrously fertile Central Valley. We add our raw Black Sesame Oil and sesame seeds to organic pistachios and season them with honey and a dash of Royal Himalayan Pink Crystal Salt. Our Organic Raw Black Sesame Tahini is a glorious, shining black. Made from organic UNHULLED black sesame seeds.The taste is profoundly sesame – robust and enlivening. This is our original creation (others have since tried to copy it). We presented it to the organic food industry at the Natural Products Expo in Anaheim, California in March 2003. People were delighted, they called it “caviar”! After decades of chemical-intensive agriculture, factory farms and genetically modified organisms (GMOs) in our food, and an ongoing war against natural systems and traditional knowledge, America’s rural communities, environment and public health are rapidly deteriorating. The fatal harvest of Big Food Inc. includes rural economic decline and depopulation throughout the Americas, forced migration from Mexico and Central America, water and air pollution, aquifer depletion, pollinator and biodiversity destruction, soil erosion and fertility loss, climate destabilization, food contamination and nutrient degradation, and deteriorating public health. Unfortunately, the U.S. Congress and the White House, aided and abetted by collaborators north and south of the border, are still dishing out their standard culinary message: Shut up and eat your GMOs. Don’t worry about toxic food and obesity, heart disease, learning and behavioral disorders, the cancer epidemic, food allergies, asthma and other chronic diseases. Forget about mutant genes, pesticide residues, antibiotics, hormone-disruptors, saturated fat, refined carbs, salmonella, campylobacter, listeria, e-coli, slaughterhouse waste, added sugar and a growing list of other horrors in your food, food packaging and drinking water. Agribusiness, the Farm Bureau, and an army of public relations flacks want us to stop complaining. They want you to believe that if we work together — farmers and consumers — we can make Fast Food Nation great again. Just follow the example of our corpulent commander in chief in the White House: Chow down on a juicy Big Mac today, and every day. Keep the faith in America’s industrial food system and Monsanto’s minions — indentured scientists, politicians, dieticians, regulatory agencies and the mass media. Disclaimer: The entire contents of this website are based upon the opinions of Living Tree Community Foods, unless otherwise noted. Individual articles are based upon the opinions of the respective author, who retains copyright as marked. The information on this website is not intended to replace a one-on-one relationship with a qualified health care professional and is not intended as medical advice. Living Tree Community Foods encourages you to make your own health care decisions based upon your research and in partnership with a qualified health care professional.